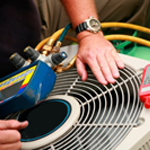 Commercial and industrial HVAC systems are powerful machines, yet they are also delicate pieces of equipment. It sounds contradictory when you first hear it, but those who work closely with HVAC systems will tell you the exact same thing. After all, a poorly maintained system will break down much faster and use up more energy—two things that can significantly increase your costs. We can help prevent such a scenario from happening. R.J. Mechanical offers comprehensive preventive maintenance services to all commercial and industrial customers throughout Cleveland and the rest of Northeast Ohio. With over 60 years of experience in the HVAC industry, you can count on our N.A.T.E.-certified service technicians to keep your entire HVAC system purring like a kitten. To learn more about our preventive maintenance services, please do not hesitate to give us a call at 1-800-805-8076. You can also reach us by sending a message through our Contact page. We proudly serve customers in Cleveland, OH and the rest of Northeast Ohio.